Scottish and Northern Irish in Origin. English variant spelling: Wiley. 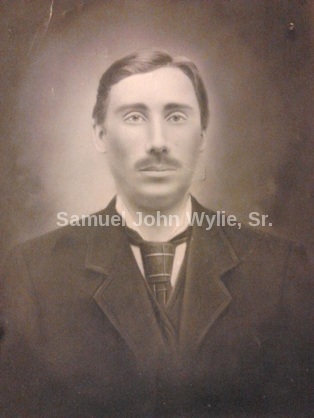 Samuel Wylie was also a family man. He and his wife, Flored Hutchison, had twelve children: Elizabeth (1777-1818), John (1778-1861), James (1780-1780), Margaret (1782-1834), Samuel (1783-1846), Sarah (1786-), Mary (1787-1856), Moses (1790-1852), Oliver (1790-1814), James (1795-1869), Florence (1795-), and Rebecca (1797-1891). Listed in Samuel's will is property in Ohio. Many of the children and their spouses relocated to Ohio. Elizabeth married Matthew Mitchell (1744-1835). They had Samuel (1799 - ), Mary (1800 -), Flora (1802 - ), Matthew (1804-), John (1806-), William (1808-1814), James (1810 -), David (1812-), Ann (1814-), Rebecca (1816-), and Jane (1818-1838). 4 Samuel, Mary, Flora, Matthew, and John were born in Pennsylvania. William, James, David, Ann, Rebecca, and Jane were all born in Ohio. John (1778) may have married Mary Ferguson. Presumably, John was sent to Ohio to purchase land for his father. Samuel Wylie stayed in Pennsylvania and had at least two children: J.P. and Rebecca. His wife is currently unknown. Sarah Wylie married Thomas Drennen. Mary married Nathaniel Kirkpatrick and they had seven children: Flora, Nancy, Samuel (1813-1816), Samuel Oliver, Sarah, Robert, and James. Although the family first lived in Pennsylvania they did move to Ohio. Oliver Wylie, twin of Moses Wylie, died in Pennsylvania when he was in his early twenties. Rebecca Wylie married William Elliott. He married twice. The first to Mary or "Martha" Parkhill. The couple had one child: Mary Jane Wylie before Mary died. James was sixty-four years old at the birth of his first child. After the death of his first wife, James married Elizabeth Calderhead Easton, who had been born in Carluke, Scotland. They had five children: Samuel John (1860), James Renwick (1861), Margaret Lindsay (1863), Bryce Easton (1865), and William Parkhill (1868). Elizabeth was given one thousand dollars, the equivalent to over $17,000 in 2015 (based on the inflation calculator located here). He left his children five hundred dollars each, which should be given to them when they came of age. One may find it interesting that James was so invested in the education of his children - he wanted them to have an English Education and he wanted them, in their adult life, to dedicate themselves to a trade or profession. He also expressed a desire that his daughter from his first marriage not only receive her share of his estate, but also the items that had been her mothers: blankets, quilts, sheets, and china. Much of what was left for Elizabeth came with the stipulation "as long as she remain my widow." James Wylie was a man who, in his lifetime, lived in a new nation and saw the same nation torn apart by civil war and the beginning of Reconstruction. The only child of James Wylie and Mary Parkhill Wylie, Mary Jane was born about 1856. Her mother died shortly after her birth. Born and raised in Pennsylvania, Mary did not stay in that area for her adult life. She met and married Charles Orr on October 26, 1887.13 They had a child, Roy, who was born in Peoria, Illinois. Roy married Helene Pitsch, from Germany, and they had three children: Richard (1921-2001), Alice (1925-), and Julia (1927-). Margaret, the second daughter of James Wylie, was born on March 6, 1963 in Elizabeth, Pennsylvania. She also bore the name "Lindsay" after her mother's, Elizabeth Easton, family. She died January 18, 1889. She never married. Bryce Easton Wylie, son of James and Elizabeth Calderhead (Easton) Wylie, was born in Elizabeth township, Allegheny county, Pennsylvania, May 4, 1864. He acquired his education in the public schools and at the Elizabeth Academy, and in 1887, in association with James Whitlatch, established the hardware the hardware business of Wylie & Whitlach, the partnership lasting two years, and then Mr. Wylie bought out the interest of his partner. The business had been located on Market street, and Mr. Wylie then associated himself with his brother, William P., the firm name becoming Wylie Brothers. In September, 1889, they moved to their present location, and in 1901, they erected a three-story brick building, which now houses their business. They deal in stoves, farming implements, and in hardware and everything pertaining to it. Mr. Wylie is also vice-president of the State Bank of Elizabeth. He is Independent in local politics, and gives his allegiance to the Republican party in national affairs. As a member of the common council of the borough, he has served two terms. He and his wife are members of the United Presbyterian church, in which Mr. Wylie serviced as trustee for a number of years, and is now ruling elder; his fraternal connection is with the Improved Order of Heptasophs. William Parkhill Wylie was the last child born to James and Elizabeth Wylie. He married Margaret Alma Tupman (1883-1958). They had one son, William Wylie, in 1913. William P. Wylie died in 1955 in Arizona. (fig.7) Samuel John Wylie, Sr.
Farm life was not all that occupied the time of the Wylie children. A fourteen year age difference separated the brothers. The youngest child of the Wylie family, Samuel John Wylie, Jr., grew up during the time of Baseball and the Great Bambino. He came to love America's favorite pastime. It was the year that John was born that Babe Ruth first made a name for himself in the sport. The "Bambino" and other baseball players were an inspiration for the young boys of Pennsylvania, who formed their own baseball teams. No doubt, Samuel grew up listening to tales of his uncle Ren playing baseball, which surely only strengthened his own interest and love in the sport. Samuel John Wylie, III came to San Angelo to attend school at Angelo State University. It was there that he met his wife Kathleen White. Kathleen, the youngest of four children, had spent the majority of her life in San Angelo, although her family had also lived in Florida, Georgia, and Berlin. They had two children: Heather (1988) and Caitlin (1992). Fig. 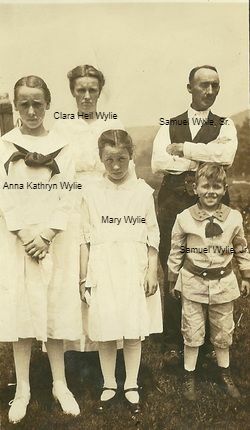 2 - "The Wylie Family" retrieved from ancestry.com, courtesy of Robert Hawkins. 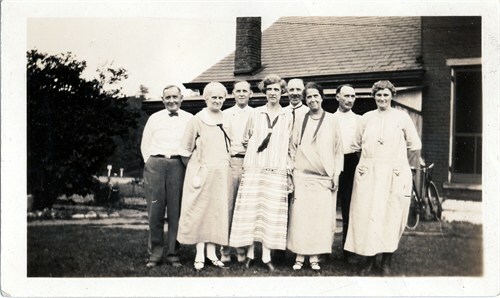 Left to right: Bryce Easton and Laura Thompson Wylie, William Parkhill and Margaret Tupman Wylie, James Renwick "Ren" and Laura Steele Wylie, and Samuel John and Emma Heil Wylie. Photo courtesy of Robert Hawkins. Fig. 5 - "James Renwick Wylie" - located on the Pennsylvania House of Representatives website. Fig. 6 - "Bryce Wylie" - located in John Jordan's edition of "Genealogical and personal history of Western Pennsylvania Vol.2"
Fig. 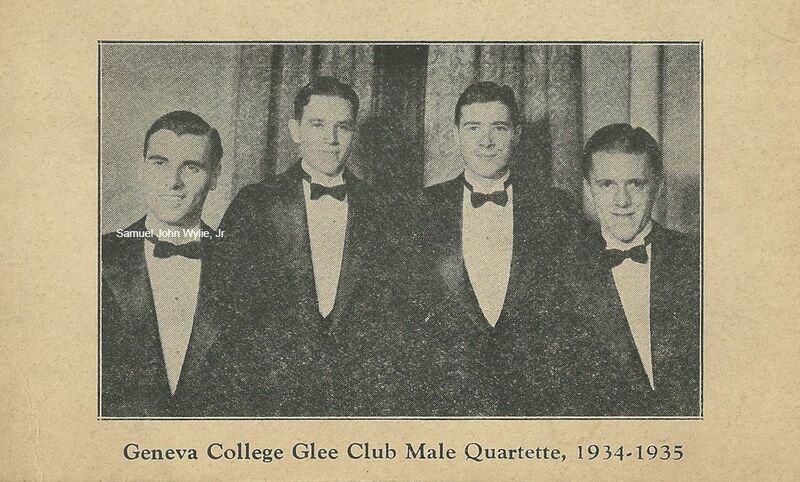 9 - "Geneva College Glee Club Male Quartette" - contributed by Heather Wylie. Samuel John Wylie is the first individual to the left. Fig. 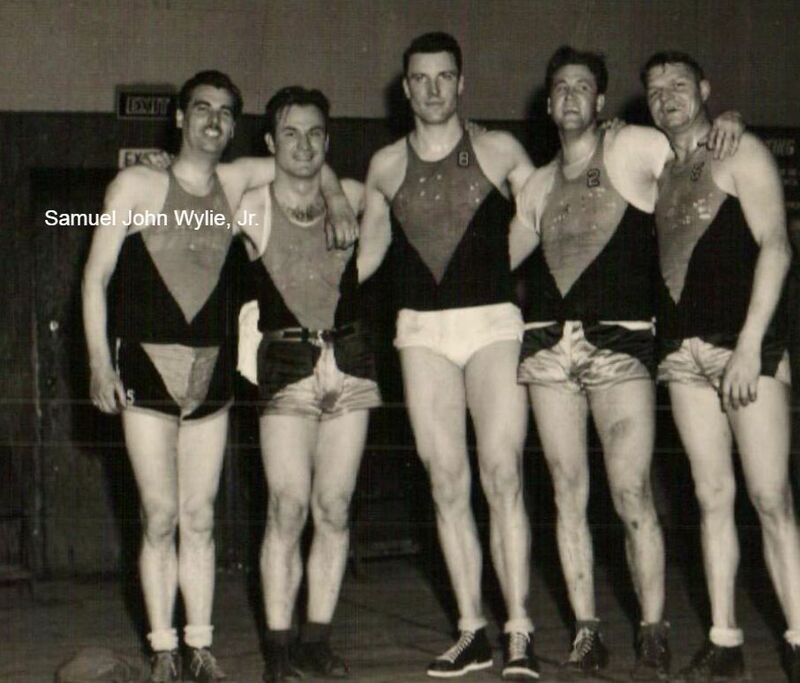 10 - "Men's Basketball" - contributed by Heather Wylie. Samuel John Wylie is the first individual to the left. Fig. 11 - "John and Josephine" - contributed by Heather Wylie. Fig. 12 - "Josephine, John, and Little John" - contributed by Heather Wylie. 1. Jordan, John W. "Wylie Family of Western Pennsylvania." Genealogical and personal history of Western Pennsylvania Vol. 2, eds. John W. Jordan. 2. Genealogical writing by Kathryn Wylie Hutchinson. Date Unknown. 4. Perrin, William Henry, J.H. Battle, O.L. Basking & Co. History of Logan County and Ohio: Containing a History of the State of Ohio. O.L. Baskin & Co., Historical Publishers: Dearborn Street, 1880, Pg. 697-698. 5. Memoirs of Muskingum County, Ohio. The Goodspeed Publishing Co. Chicago: 1892, pg. 302. 8. Jordan, John W. "Wylie Family of Western Pennsylvania." Genealogical and personal history of Western Pennsylvania Vol. 2, eds. John W. Jordan. 9. Interview with Helen Wylie Morrison. Date unknown. 11. Wylie, Samuel John. "Meet the Wylies." Personal Publication. Date Unknown. 14. 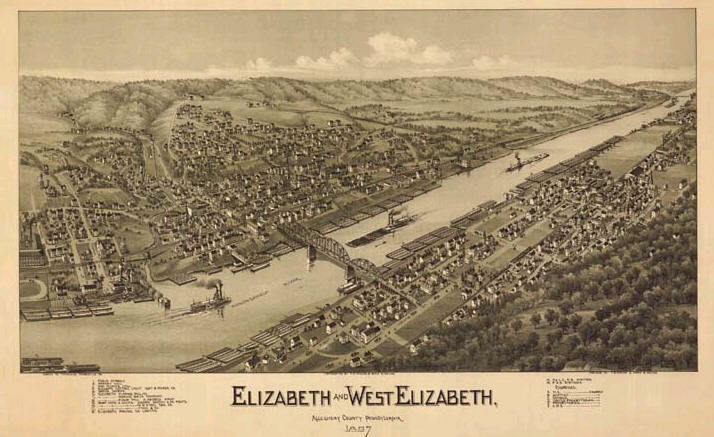 Genealogical and Personal History of Western Pennsylvania, Vol. 2. Edited by John Woolf Jordan. Lewis historical publishing company, 1915. 15. Wylie, Samuel John. "Meet the Wylies." Personal Publication. Date unknown. 17. Interview with Kathleen White Wylie. Date unknown. 19. Wylie, Samuel John. "Meet the Wylies." Personal Publication. Date unknown. 20. Recollection of Heather Wylie. Date unknown. 21. Interview of Harold Worden Wylie. Date unknown. 22. Wylie, Josephine Frantz. "This is My Life." Personal Publication. Date unknown. 23. Wylie, Samuel John. "Meet the Wylies." Personal Publication. Date unknown.